Have you ever wanted to just pack up, hit the road to and not look back? To go somewhere so beautiful, so peaceful and so secluded the busy world around you would fade away? If you have, a Canada Wilderness Canoe Trip may be for you. Canada wilderness offers many rivers, lakes and ponds to portage through and enjoy. A wilderness canoeing and kayaking trip can be whatever you make it. 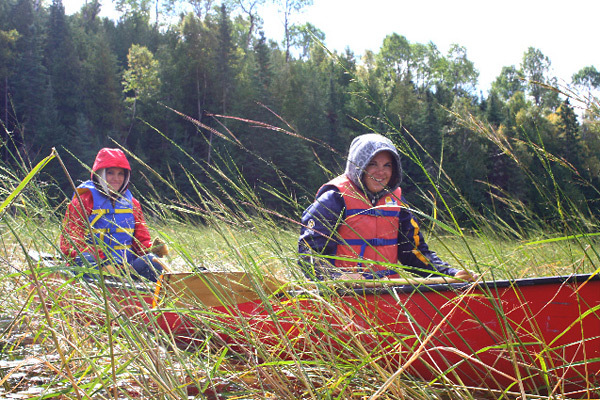 Some go out in the wilderness in a canoe for a day to enjoy the fresh air, Canada scenery and exercise. Others bring their fishing rods, and head out in search of that next big catch or better yet, supper. Some extreme Canada wilderness canoeists and kayakers even go canoeing through the rapids! This can be a very thrilling adventure. Canada canoeing can be done as a day trip or even a week trip! Portaging, the act of carrying your canoe/kayak and luggage through the Canada wilderness to another lake, makes it possible to go to many lakes in one day and camp at different locations. Portaging a canoe is the ultimate Canada wilderness canoe trip. You get to see uncharted Canada land, experience Canada wilderness to the fullest and really get away from it all. It is a great bonding experience, adventure and it will make memories that will last a lifetime. !Canoeing has been a large part of Canadaʼs history. The original Canada canoes were first used by Canadaʼs First Nationʼs people for transportation, hunting and war through Canadaʼs wilderness. Waterways across Canada served as wilderness highways. Europeans also used canoes once they came to Canada, and used canoes and the waterways as their main means of transportation during the fur trade. 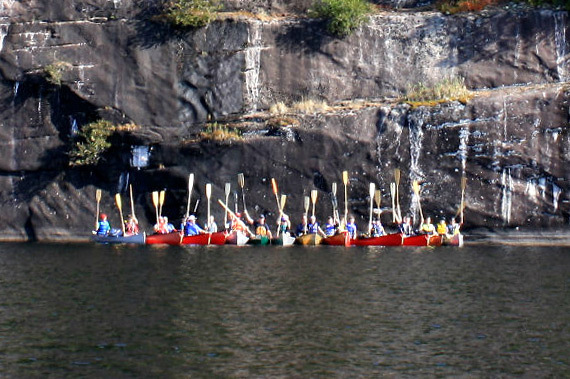 The Canada canoe was perfected by Canadaʼs First Nations. They constructed birch bark canoes that were light, durable and streamlined for navigating the many waterways in the area. Some of Canadaʼs wilderness canoes were also made of hollowed out trees. Birchbark canoes weigh less than 300 lb, however they can double their weight when wet. They are capable of carrying many times their weight in luggage. Canada birchbarkcanoes were fairly fragile and were easy to tear if they were hit against a rock. There were two canoes commonly used to make a wilderness trip. The “canot du maitre” or Montreal Canoe was rather large. It carried a crew of 12 paddlers and got up to 12 meters long. The smaller canoe was the ”canot du nord”. It was about 7 meters long, however it was still light enough that it could be carried by the crew. The usual speed for Canada voyageurs was about 40 strokes a minute which allowed the canoes to go about 5 miles per hour. Wood canoes are still available, even in todayʼs market. They are the most aesthetically appealing of all. However wooden canoes can be quite pricey and fragile. They are also not very light. Wooden canoes are good for short trips to the cabin on a peaceful wilderness lake where you can avoid rocks and not have to carry it everywhere. A wood and canvas canoe can be quite quiet in the water. They stay cool in the hot sun and they are still very high in demand. Although pricey, they are very deep rooted in history and are quite aesthetically pleasing. Wood and canvas canoes are great also great for a trip to the cabin in the wilderness. They are ideal for fishing or wildlife spotting because of their ability to be so quiet. Fiberglass canoes can be pretty heavy. Their fibers are not very strong and make puncture in rough waters or if they collide again a rock or any other hard object. They are fairly cheap canoes. Fiberglass canoes should be avoided if you plan on taking a trip out into the wilderness and portaging your canoe or going in rough waters. Kevlar canoes are woven from a fiver developed by the Dupont company as a tire cord. Kevlar 95 provides strength without weight, making them ideal for a portaging and canoeing trip to the wilderness. Royalex Canoes are nearly indestructible. They are very flexible. However, portaging would not be fun as they are fairly heavy on land and slow in water. On the plus side, they are durable which makes them ideal for a wilderness whitewater canoe trip. Recreational kayaks can accommodate from one to three paddlers. Single (1), tandem (2) tri-yak (3).Kayaks are a wider width for stability. They are usually less than 12 feet in length making them slower but lighter to lift. They have limited cargo capacity. Usually made of rotomolded plastics that keep their cost around $300-$800. These kayaks are great for wilderness fishing trips. Tandem kayaks accommodate two paddlers. They can be manufactured in a variety of materials. They usually either have one very large cockpit or two separate cockpits. Tandem kayaks, as well as tri-yaks, require team work to synchronize paddling and maneuver. They are also very useful for moving gear or luggage during a trip as they have the extra space needed for storage. Sit-on-top-kayaks are kayaks that work just like their name - you sit on top! They do not have a cavity to sit in, but rather and seat on top of a closed in kayak. They are ideal for youth sized paddlers or beginners. They are very easy to flip over if you tip them because they are filled with air and do not fill with water. They are also easy to keep upright because they have a wider beam which adds stability. They are not recommended for long trips as their is little to no room for storage of equipment. They are only sold in solo or tandem. Inflatable kayaks are highly engineered, lightweight, durable and easy to use providing a great kayaking experience during a trip. A simple foot pump is used to fill them with air. Because they are filled with air, they are the most buoyant and lightweight of all kayaks. They come in solo or tandem style. Theyʼre lightweight and ability to be compacted makes them very easy to travel with. These would work well on a trip if you are willing to deflate and reflate it as you portage. Folding kayaks have a collapsible frame which makes for easy storage and trips. They are as sturdy as a hard shell kayak and very versatile with ample storage for trips. Folding kayaks are easy to assemble. They generally are sold in solo or tandem styles. ease and comfort. There are three main parts to a paddle: the grip, shaft and blade. Choosing a material should be based on your taste and how much money you are willing to spend. There are good and bad paddles of every material. A good paddle is light, strong, comfortable and within your price range. It is unlikely that you will find a paddle that fits all of these characteristics, so you need to decided what you value more. If you want a light weight, high strength paddle your going to have to pay a bit more, defiantly over $100.00. If you can settle for a slightly heavier paddler you will find less expensive choices. When choosing a paddle, consider the conditions you will be paddling in. Wooden paddles retain hand warmth. Fiberglass paddles are virtually maintenance free as well as lightweight ad durable. Carbon fiber paddles are the lightest by far but cost a little more. Aluminum and plastic paddles are durable and cheap but much heavier. Your hand size also may help you choose your paddler. Small hands may tire and get sore holding onto a thick paddle all day. Holding your paddle should feel comfortable and natural. Paddles also come in many different sizes. Paddle blades vary greatly in size and shape. Large symmetrical blades power through water quickly but each stroke requires a lot of energy. Asymmetrical blades paddle the most efficiently. They allow a more horizontal stroke which uses less energy. These paddlers are ideal for long trips. Blades can be either flat, cupped or dihedral. Cupped blades are curved like the head of a spoon, which helps the blade remain stable as you paddle. Dihedral blades help water flow smoothly and evenly over the paddle to prevent fluttering or twisting.The most important dimension is the paddle shaft. Solo paddlers in wider canoes may want longer paddlers than a canoeist in a slim canoe or kayak. Ontario has many canoe and kayak routes which are spread out among many Canada lakes and rivers. A Canada canoe wilderness trip is the ultimate adventure. Path of the Paddle is an organization based around the sport of canoeing and kayaking. In the upcoming years, they intend to make a new wilderness trail system called the TransCanada Trail that will be able to connect a 900 km water based trail from Shoal Lake, Manitoba to Thunder Bay, Ontario. The entire route will flow through Thunder Bay, Atitkokan, Dryden, Ignace, Kenora as well as many other first nationʼs communities and provincial parks. When the trail is completed, it will be known as on of the longest water trails in the world. This trail will allow canoe and kayakers to discover all sorts of new and uncharted territory as well as travel paths used many years ago by fur traders and first nations people. Once the trail is completed it will span 22,500km and will connect the Atlantic to the Pacific and the Arctic Ocean, linking nearly 1,000 communities. The proposed completion of the trail is 2017. A day canoe trip can give you the fun experience of canoeing, without the hassle of portaging and camping. A wilderness day trip is great for beginners or people just wanting to get out on the lake and enjoy Canada wilderness. Many people also go canoeing in the rapids for a day. Although more dangerous, this is a very thrilling and amazing experience- for those canoeists and kayakers that want a challenge. It is a good idea to learn about the rapids you will be canoeing through ahead of time, to ensure you donʼt put yourself in danger. When going on a day trip is a good idea to wear appropriate clothing. A T-shirt and quick dry shorts are good, pack an extra sweatshirt and jacket incase you get chilled. Snacks are also a good idea and fresh water. If you are going for a fishing day trip, along with your rod and tackle you might also want to bring supplies for a classic Canadian wilderness canoe trip shore lunch. Many resorts, lodges and provincial parks in Canada offer canoes and kayaks that are available to rent for a short day trip on the lake. Long canoe trips are for the true Canada wilderness explorers. An extended canoe or kayak trip is more difficult but the experience in the end is worth it. Long trips require light packing of necessary items, food, a planned out route, and a willingness for adventure. When planning a long trip it is a good idea pack light, as you will have to portage your canoe or kayak as well as all of your luggage to the next lake or river. Portaging requires a padded canoe yoke which rests on your shoulders to hold up the canoe, with your luggage and equipment carried on your back. You can see why packing light is very important. However, all of the work is worth it when you see uncharted Canada wilderness. Beautiful birds, breathtaking scenery and clear freshwater lakes. Long canoe trips awaken your senses like no other. 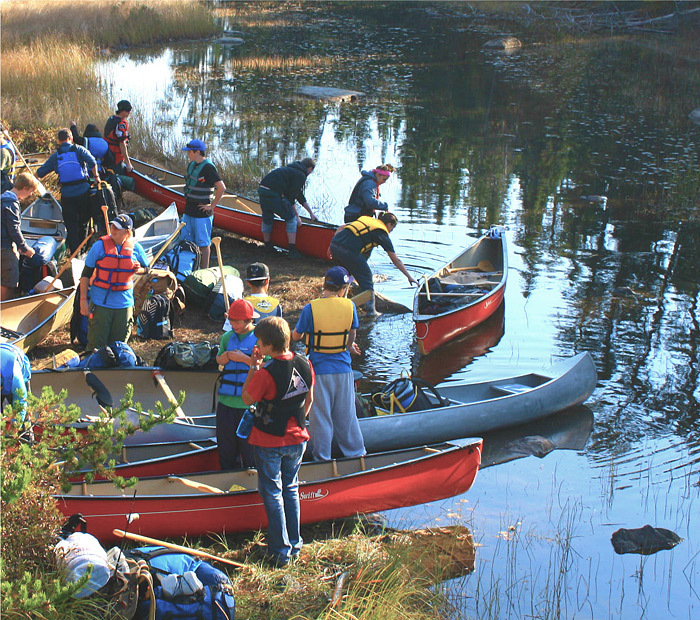 These Canada wilderness canoe trips are great for character building. Paddling a tandem canoe and portaging requires patience, strength, determination and teamwork. Trying to figure out what to bring when you are packing for a camping trip can be daunting. What will you need? What will you need to just leave home? To help you pack for your Canada wilderness canoe trip, we have put together a list of things to consider bringing. It is a good idea to load and unload your canoe while itʼs still in water. While canoeing, keep all of your equipment safely secured to the canoe incase you experience waves or rocking. When deciding where to sit, it is a good idea to put the more experienced or stronger person in the back. The back has more control of direction and speed. While canoeing, stay low and steady. Do not stand up or move quickly as the canoe may tip. Canoeing close to shore is a good idea as it is easier to swim to land if you capsize, there are likely less waves and currents and if you capsize it may not be very deep making it easier to find any items gone overboard. Also the scenery by the water edge is much more interesting. Leave space around your feet incase you capsize. You donʼt want to be stuck upside down. If you are canoeing in a current and capsize, do not try to stand. You may get your foot stuck and drown. If the water is calm and you capsize, try and stay as close to the canoe as possible. If there is a current go upstream as a canoe full of water can get very heavy, and you do not want to get in its way. Always wear your lifejacket, and do not canoe under any influence.